They say if you travel the world carrying the same thoughts and attitude throughout your journey, it is as if you have never left your place. Cognition and knowledge is not about how many places you have seen; sometimes it is how you can view the same place or thing in different ways and from different perspectives. Being a national UN Volunteer provided me with the opportunity to see my country, Palestine, in a different way. Ramallah, State of Palestine: They say if you travel the world carrying the same thoughts and attitude throughout your journey, it is as if you have never left your place. Cognition and knowledge is not about how many places you have seen; sometimes it is how you can view the same place or thing in different ways and from different perspectives. Being a national UN Volunteer provided me with the opportunity to see my country, Palestine, in a different way. I was recruited as a UNV Urban Planner at UN-Habitat to support the capacities of the Ministry of Local Government where I am based. My key contribution has been to empower local communities, living in what is according to the Oslo Agreement classified as Area C*, through engaging them in the plan making process for their localities. This has been carried out through community visioning workshops, aimed mainly at creating a common ground between people and professional planners. 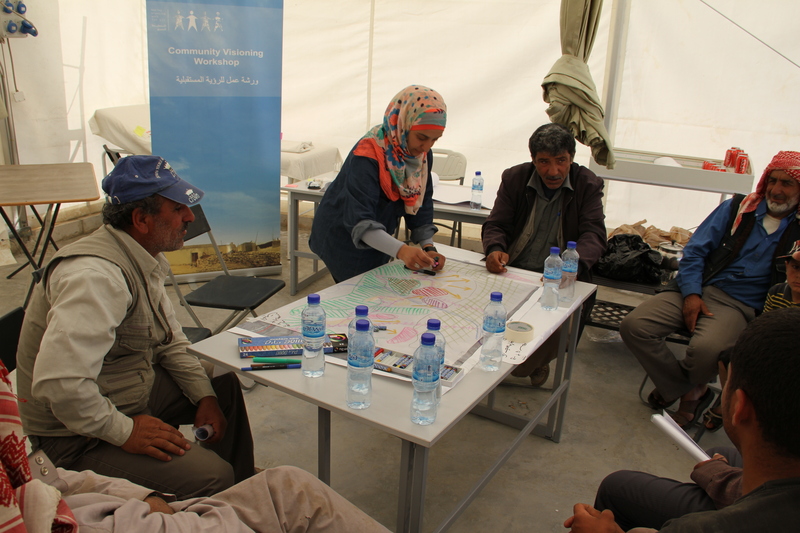 The community visioning sessions take place in the villages themselves, where participants from all different groups of the community sit at one table, and discuss their future that is usually seen as uncertain, worrying, and for some the mere act of imagining it is an exhausting and frustrating process. Having the chance to participate in these discussions, and being part of the workshops has helped me develop different perceptions of things that are often taken for granted, such as time, space and geography, especially from the perspective of an urban planner. When you work in an area under a numerous set of changing factors, where instability is the only constant, the furthest future is tomorrow and the nearest past is some year in the 1980s, when the villages were forcibly evacuated for some time, you learn how a certain time unit on a global scale can hold a different meaning on a local scale. You start to realize that in planning the time span should be measured by its impact, not its length. As for geography, this experience has allowed me, to some extent, to see a 3D print of the geopolitics that governed the situation there; it has enabled me to see the physical translation of the politics. It has also allowed me to realize how the act of connecting and separating on the ground can have a greater impact on people's definition of what is far and what is near, and how to read a map or a plan, the way it is used and lived, instead of just looking at it as a technical drawing. Serving as an Urban Planner for a UN agency has given me a unique chance to see places in my country, that I would have never normally visited, and interact with people on a different level that would not have been possible if I was not working as a volunteer. This voluntary assignment has been a great opportunity to interact directly with the community, the government and multilateral organizations, enabling me to formulate an understanding of the nature of the relationships between these counterparts. Besides organizing community-visioning workshops, engaging in the organization and implementation of several urban activism events, such as the installation of an urban café, has been another chance to mobilize young people, sensitize them to urban issues and encourage them to actively change their urban environment. These activities were organized with young volunteers just like ourselves who aspire for a change through volunteerism and engagement with them further helps spread voluntary spirit within our community.